Dewgun is a perfect example of how Bully Gang was breeding American Bullies before they were even a breed. Weighing 95 pounds and carrying a 24″ inch head, Dewgun is truely an awesome dog. Sired by Bully Gang’s Briar out of Bully Gang Cruella. Bully Gang was started by Cory Graham in Oregon nearly 25 years ago and hasn’t slowed down since. You may have seen Bully Gang American Pit Bulls in national magazines such as Dog Fancy or Dog world. 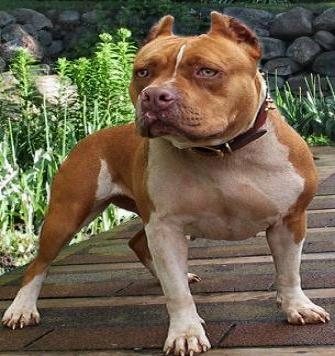 Their foundation female, Bully Gang Cheyenne, was a double bred CH Amber-lite Bogan female that produced some of the finest American pit bulls ever bred. Bully Gang’s Original Bully Bloodline started in 1990. In 2001 they began to register their dogs under the name Bully Gang with the UKC and ADBA. Bully Gang was know for breeding stocky, thick, athletic, and muscular pit bulls before the word “American Bully” even existed yet. This signature look is stamped on every full bred Bully Gang dog. Workability and trainability are two distinct characteristics of Bully Gang’s bloodline. Their temperament is loving, fearless, and loyal. These dogs are ideal for home security, weight pulling, and family companions. Cruella is the best producing females at Bully Gang Kennels and manages to reproduce herself with every breeding. While a good deal of American Bully Breeders today use english bulldogs in their bloodlines, Bully Gang achieved the American Bully structure solely on breeding experience alone. 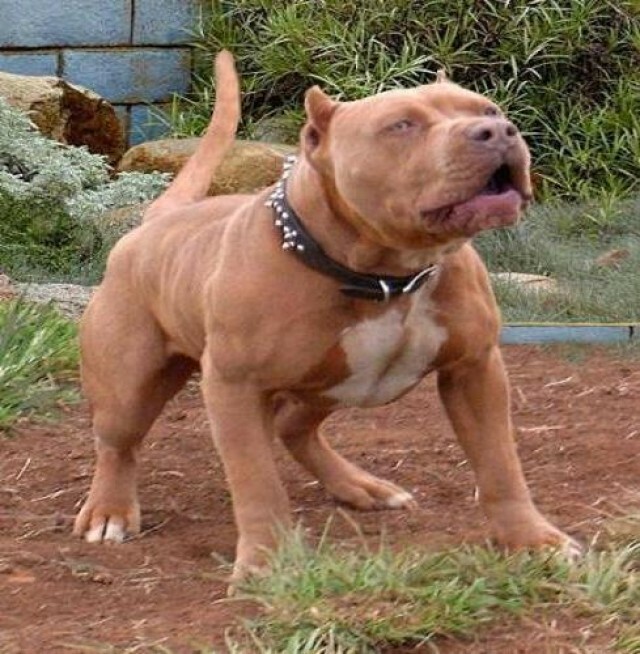 They archived the bully look by selectively line breeding pure American Pit Bull Terrier Blood generation after generation (Line breeding is a common breeding technique that invokes the selective breeding of dogs for a desired feature by mating them within a closely related line). With 16 generations of proven producing champions, and nearly 25 years of breeding experience, Bully Gang has created a truly unique and purebred bloodline that’s in a league of it’s own. This entry was posted in Featured Breeders. Bookmark the permalink.